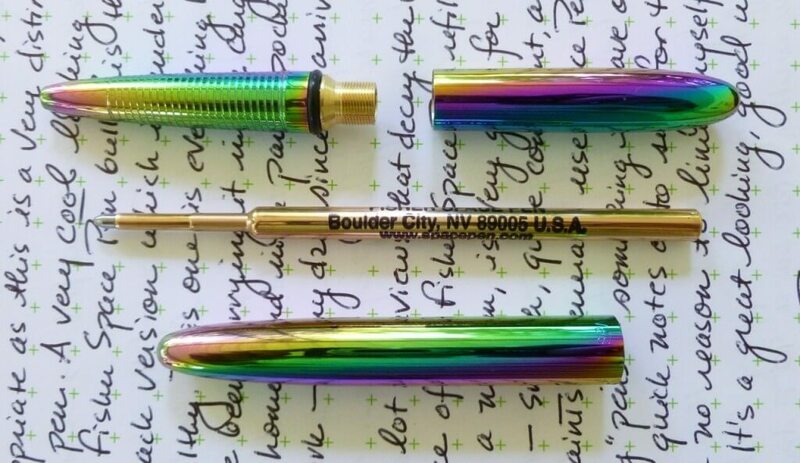 The official name for this pen is “Rainbow Titanium Nitride Fisher Space Pen Bullet Ballpoint.” That’s some name (sort of like a royal baby! ), but quite appropriate as this is a very distinctive looking pen that deserves an equally distinctive moniker. This is one COOL looking pen. 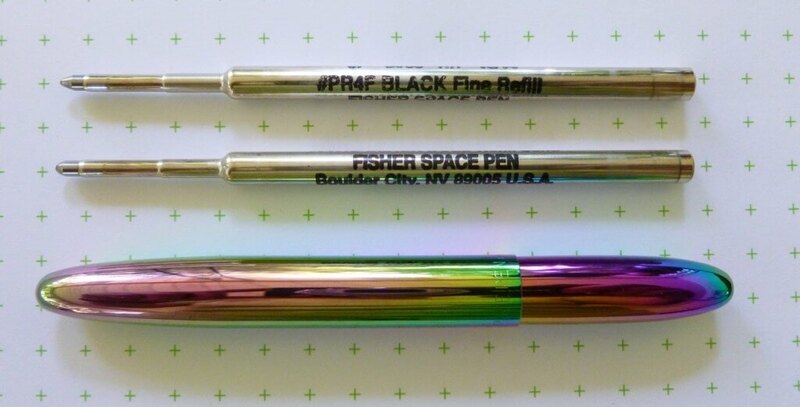 I own one other Fisher Space Pen and it’s the matte black version, which is the polar opposite of this pen. That one is stealthy and understated, while this one is flamboyant and joyous. I’m not lying when I say that just looking at this pen boosts my mood. It’s that colorful. A friend on Instagram called this the “magic finish,” and I think that’s the perfect description, and who can’t use a little magic in their ho-hum day. Since the pen arrived, I’ve been carrying it with me everywhere—in the pocket of my cargo shorts, in my purse, in my jeans pocket. It goes everywhere with me because you never know when you’ll need a pen. Or some magic. The pen is all brass, which gives it a nice substantial feel, despite it’s pocketable size. 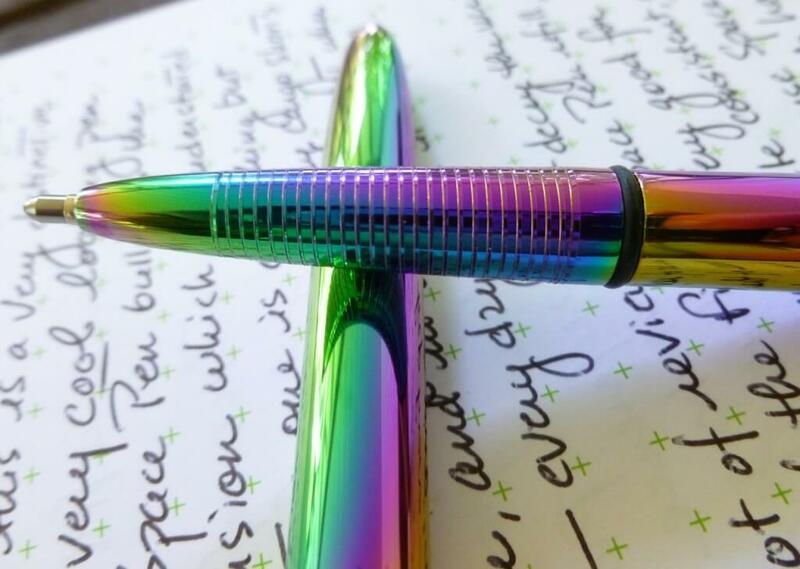 The finish is “Rainbow Titanium Nitride,” which gives the pen its swoon factor. All-metal pens can be slippery, but the grooved grip area solves that potential problem. I’ve been using the pen in the midst of our current heatwave without a single issue. When capped, this Fisher Space Pen measures just 94.5 mm (3.7″) making it an easy carry no matter how small your pockets are. Posted, the pen expands to a very usable 136.8 mm (5.4″), even for those with large hands. As I said, I’ve been using it throughout my day to sign receipts, jot entries in my datebook, and to make notes on the fly in my pocket notebook. It goes everywhere I do – except into the shower or into bed. 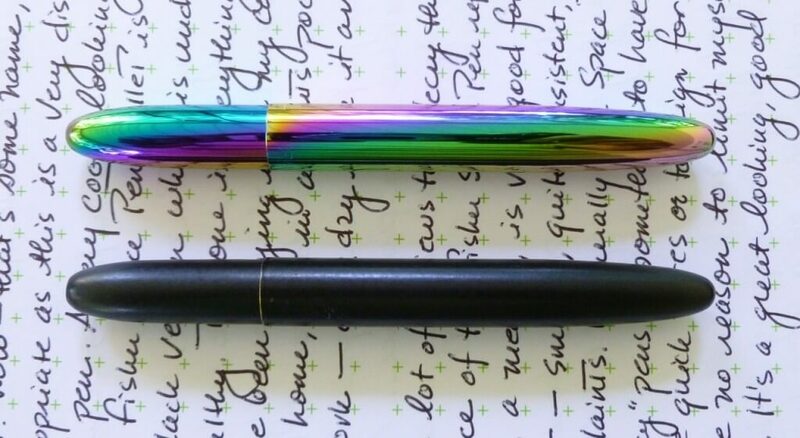 I’ve read a number of reviews that decry the performance of the Fisher Space Pen refill, but this one—a medium—writes wonderfully for a ballpoint. The feeling is silky smooth, while the line is dark and consistent. No complaints from me. I generally use Fisher Space Pens as “emergency” pens—something to have on hand to make quick notes—but I see no reason to limit myself with this pen. It’s a great looking, very good writer. There’s not a huge jump between the refill sizes, but you can see the line broaden slightly as you move from fine to medium to bold. I’d guess the lines are approximately 0.6 mm (fine), 0.7 mm (medium), and 0.8 mm (bold), give or take 0.1 mm. Personally, I’m a fan of the included medium refill but you really can’t go wrong with any of the three. All wrote immediately, without drag or a lot of white space in the letters. The special characteristics of the Fisher Space Pen’s thixotropic ink make this the perfect pen to carry for extreme situations as the ink will flow despite extreme heat (121ºC/250ºF) or cold (-34ºC/-30ºF). It’ll happily write through grease or water, and won’t quit even if you’re hanging upside down, writing at odd angles, or in zero-gravity. This is one pen that won’t let you down, no matter what your day throws at you. 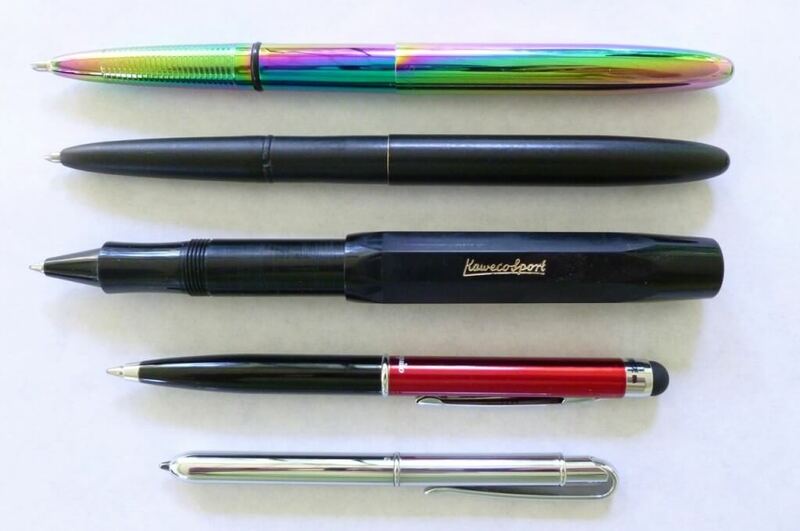 There are a lot of pocket pens out there—like the Kaweco Sport, the Monteverde Poquito, and the Levenger Walletini (pictured above), but none sport the good looks AND high-performance ink of the Rainbow Titanium Nitride Fisher Space Pen Bullet Ballpoint. Special name, special pen. 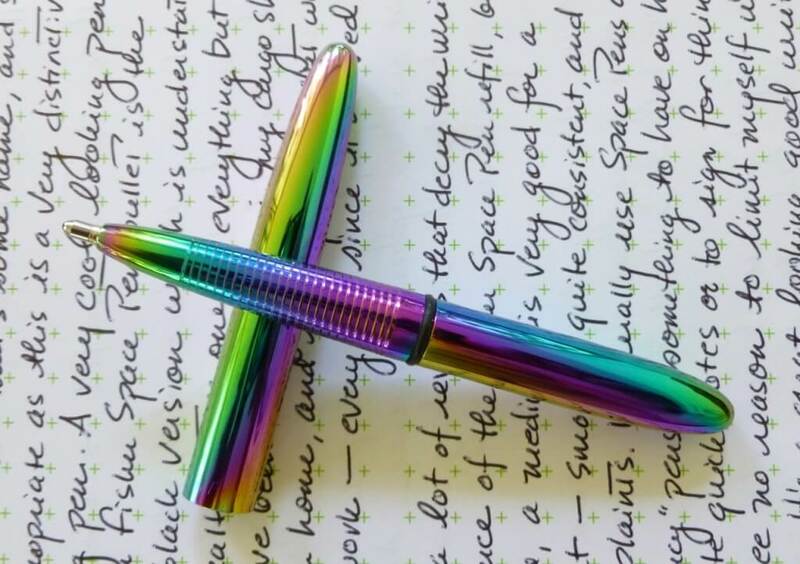 This is a pen that can write through almost all conditions, and do it with a shiny, colorful finish that’s sure to make you smile. I’ve been fascinated with pens since junior high school, where I’d save up my lunch money to buy those 4-color Bic pens. Two years ago I started writing about my growing collection of ballpoints, rollerballs, and fountain pens on my blog, From The Pen Cup. I love telling the stories of my pens.